Castleford Tigers will be represented across all this autumn’s internationals with Luke Gale earning his first England senior call-up and several other players lining up for their respective countries. For Gale it will be a dream realised if he is chosen to start for England against New Zealand in the forthcoming three-match Test series or in the warm-up match against France. Back at the start of the year before he had made his first Super League appearance for Cas the half-back told the Express how it was his ambition to force his way into the international set-up – and after a string of impressive displays he has done exactly that, crowning a year in which he was selected in the dream Team and also won the Albert Goldthorpe Medal. After hearing of his selection, Gale said: “I tasted a bit of England when I played with the Knights a couple of years ago. “That leaves you wanting to taste more. “I went from the bottom team, Bradford last year, and I have gone to Castleford and the season has gone fantastically so I am real pleased. Castleford-raised Brett Ferres joins Gale in the England squad, but the omission of Tigers skipper Michael Shenton is a surprise after he has enjoyed another consistent season and was also included in the Dream Team. Tigers half-back Liam Finn is in the Ireland squad for their 2015 European Championship campaign along with former Cas player Ben Johnston. 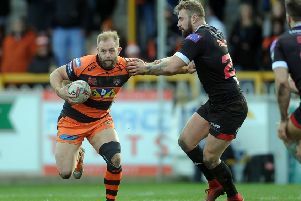 Outgoing Tigers centre Michael Channing and former Cas prop Dan Fleming have been included in the Wales squad while another ex-Cas prop, Jonny Walker, is in the Scotland squad, which is captained by Danny Brough.